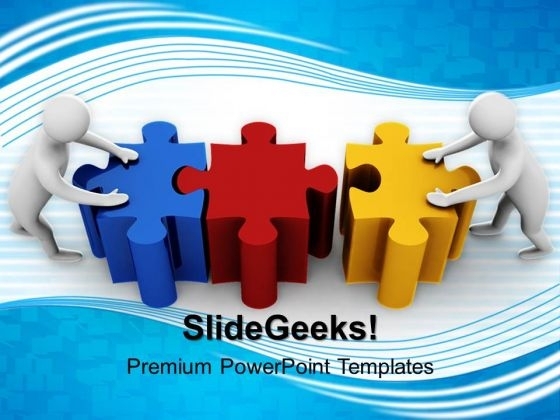 3d Men Connecting Puzzle Teamwork PowerPoint Templates And PowerPoint Themes 1012-Emphatically define your message with our above template which contains a graphic of two 3d men connected jigsaw puzzle pieces. This image represents the concept of teamwork. Use this template for solving puzzle, to guess riddles, finding solutions, strategies and schemes, business concepts and ideas presentations. The structure of our templates allows you to effectively highlight the key issues concerning the growth of your business.-3d Men Connecting Puzzle Teamwork PowerPoint Templates And PowerPoint Themes 1012-This PowerPoint template can be used for presentations relating to-"Men connecting puzzle pieces, teamwork, business, puzzles or jigsaws, people, success" Introduce your plans with our 3d Men Connecting Puzzle Teamwork PowerPoint Templates And PowerPoint Themes 1012. Make sure your presentation gets the attention it deserves. Add to the adventure with our 3d Men Connecting Puzzle Teamwork PowerPoint Templates And PowerPoint Themes 1012. Take your thoughts for a roller coaster ride.